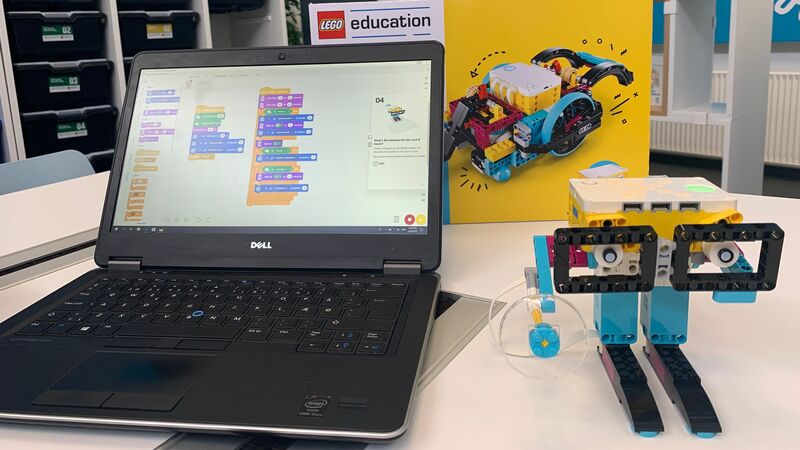 Lego's education unit is making its biggest product debut in three years, unveiling Spike Prime, a new kit that aims to mix the company's familiar bricks with motors, sensors and introductory coding lessons. Why it matters: Lego isn't alone in trying to use its toys as a gateway for STEM education, with startups like LittleBits and Sphero also entering the space. The details: The kit will sell to schools for about $330 and be available in time for the next school year. Aimed at middle schoolers, creations made with Spike Prime can be controlled via a drag-and-drop programming language built on Scratch via apps for iOS, Android, Chrome OS ands PCs. Axios traveled to Lego's home town of Billund, Denmark for a behind-the-scenes look at the product and its development. The mix of bricks, motors and sensors can be used to create everything from a rudimentary printer to a virtual meteorologist that taps the Internet to tell you the weather from anywhere in the globe — all in lessons that fit into a typical 45-minute class period. "There’s a great connection between confidence in STEAM and general confidence," Lego Education president Esben Stærk Jørgensen said in an interview. The most noticeable difference between Spike Prime and its predecessors from the Mindstorms line are the bright colors and personalization options that make it a lot more approachable than past products. "We want it to be as intuitive as the brick, the opposite of being intimidating," Jørgensen said. Lessons learned: Jørgensen said that not every product it has aimed at the classroom has been a hit, but the failures have also been meaningful. One recent example is 2014's StoryStarter, which aimed to use Legos as a starting point to help students express themselves. StoryStarter didn't take off, but some of its focus on storytelling was added to Spike Prime in an effort to make the product appeal to a wider range of students. Unlike past robotics efforts, for example, Spike Prime contains Lego minifigures and other elements designed to give the projects more personality. Fun Fact: Spike Prime also contains 11 new Lego elements, ranging from a large Technics base to new clips to bricks that help bridge the world of Lego and Technics. That's a lot for one new product and sure to have Lego die-hards clamoring to get their hands on the product. Although Spike Prime is only being sold through Lego's education channel, those products will be available online for individuals that really want one. For more, check out this video. And we'll have more on Lego's education efforts and our trip to Denmark in Wednesday's Login.